10. 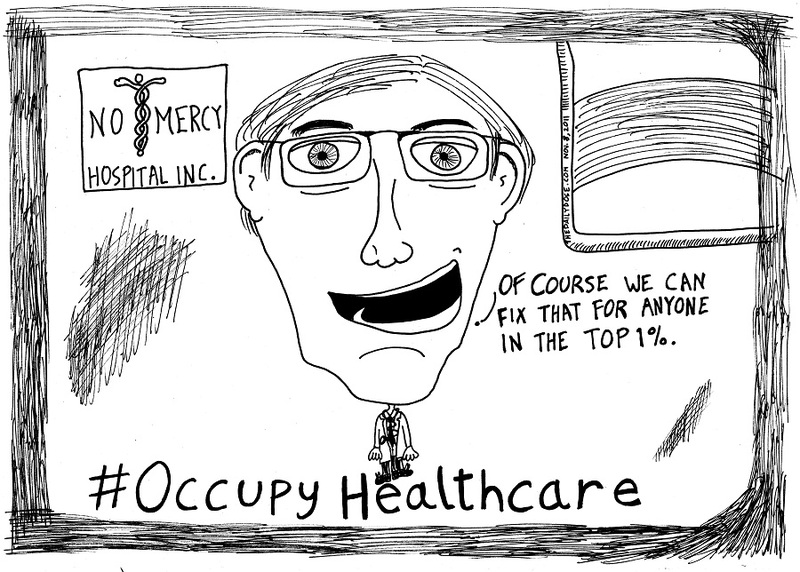 #OccupyDoctors – Because you really don’t want any of the top 1% of doctors performing surgery on you, right? 9. #OccupyNurses – If you’re lucky, the nurses will be hot and occupy you back. 8. #OccupyOrderlies – You make a mess. They clean it up. Just like a Wall Street banker. 7. #OccupyHMOBureaucrats – The ultimate nitpickers whose penchant for pencil pushing is an affront to life, liberty, and the pursuit of obliterating red tape from your path to happiness. 6. #OccupyHospitals – If millions of people fill up every Emergency Room with frivolous cases, would you want the hospitals to remove the top 1% of really sick patients? 5. #OccupyPrevention – Because when it comes to Wall Street and debt, an ounce of prevention is worth a few Trillion dollars of bailouts. 4. #OccupyHealthcare – It is the right of the people to assemble peacefully and demand medical treatment of their obesity caused by an inability to put down the Twinkies. 3. #OccupyEMTs – Because nothing helps trauma victims like interfering know-it-alls. 2. #OccupyHospices – When the bell tolls, too many of the other 99% end up there for it to be run exclusively by old nuns and underemployed medical staff. 1. #OccupyFirstAid – Because CPR – just like Centralized Populist Regulation – interferes with nature to save the incapacitated from dying.